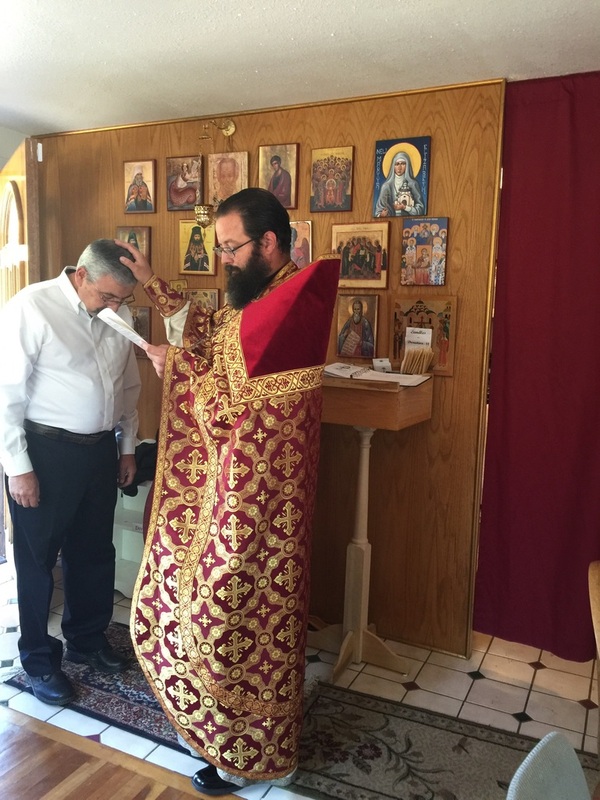 On Sunday, October 2nd, Father Theophan laid his hand on the head of Frank Lucero and through the grace of our Almighty Lord, Jesus Christ, made him a catechumen of the Orthodox Church. Frank has taken the first official steps in becoming a full member of the Orthodox Church. May God Grant him enlightenment and many blessed years! 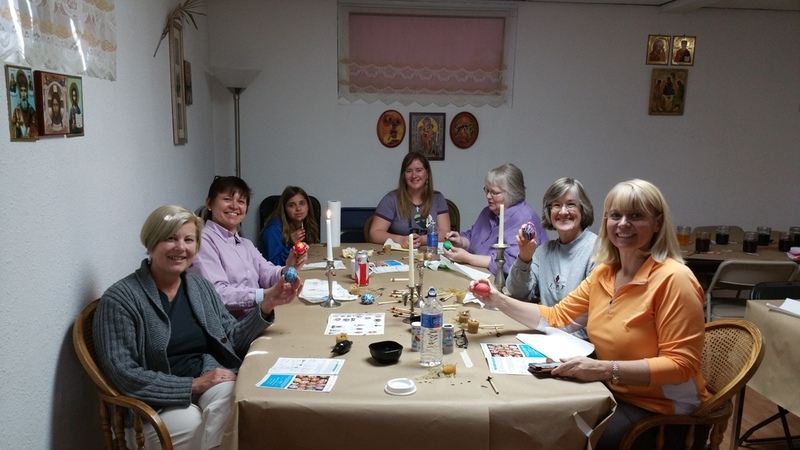 On November 15, 2015, St Job Church offered a panikhida for the victims of the Paris terrorist attacks. In the Eastern Orthodox Church, a panikhida is a memorial service (liturgical solemn service) for the repose of the departed. Our prayers and thoughts are with the victims and their families. May their memories be eternal! 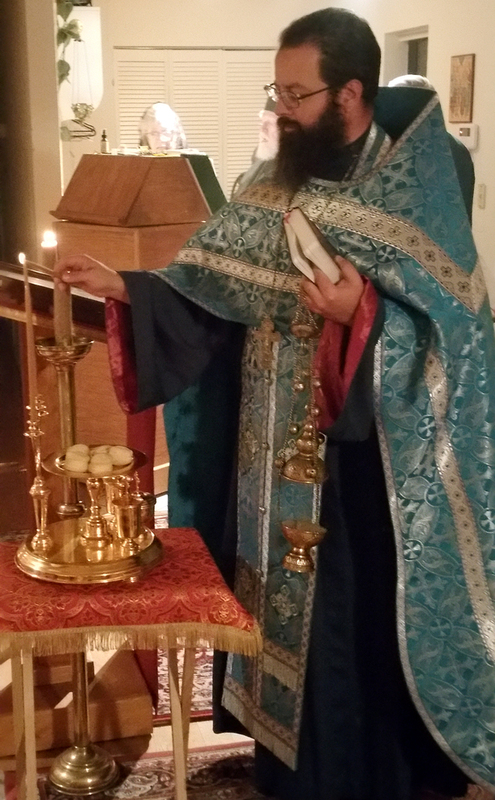 Santa Fe, New Mexico - The instructor for the Workshop on June 15-20, 2015 was Father Mefodii, a Priest-monk from the Skete of Saint Maximos the Confessor in Palmyra, VA. Fr. 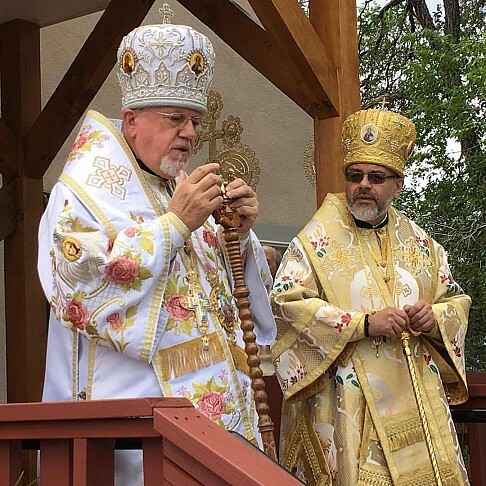 Mefodii has been an ordained priest for almost 35 years during which time he has been a parish priest, spiritual director of a college seminary, diocesan representative to various religious and interfaith organizations, and an author and student of Byzantine-Russian Iconography. Fr. Mefodii holds two degrees in Theology: Magister der Theologie (M.Th.) from the Theology Faculty of the University Innsbruck, Austria; and a Master of Arts (MA) in Eastern Christian Theology from the John XXIII Institute for Eastern Christian Studies at Fordham University, Bronx, NY. He has been a student of Master Iconographer Vladislav Andrejev since 1991 and instructor at santa Workshjop since 2005. Born in St. Petersburg, Russia, Mr. Andrejev discovered his artistic abilities at an early age. At 14 he was accepted in a special art school for gifted children. He also attended Tavrichesky Art Institute. Studied graphic art and book illustration at Polygraphic Art Institute in St. Petersburg, classical painting and sculpture at the Academy of Fine Arts, also in that city. After completing art school Mr. Andrejev worked as an illustrator of books and magazines. Becoming dissatisfied with the expression on only the external, he started a search for the spiritual. He became a wandering pilgrim traveling from one Russian Orthodox monastery to another, on the way meeting remarkable monastics, who despite the Soviet repression practiced their Christian way of life. One of these was an artist and restorer of Icons. Vladislav spent a year with this monk studying the Russian Orthodox tradition. Resuming his travels he painted Icons occasionally for individuals and churches, a dangerous occupation in that political climate. In 1979, Vladislav Andrejev emigrated from Russia, accompanied by his wife and four year old son. After living briefly in Vienna, Austria in 1980, he moved on with his family to California. where he had several one person shows. His artistic and spiritual development was clearly towards the Icon and in 1981, he and his family moved to the East Coast. During the next two years Vladislav designed and illustrated, in the medieval Russian Byzantine style, the Gospel according to St. Matthew. In 1986 this manuscript won Best of Show at the Billy Graham Art Center in Illinois, and was later published in English by Oakwood Publications, now a part of Saint Vladimir’s Orthodox Seminary Press. On the eve of Theophany, after the Divine Liturgy on Sunday morning, the faithful of St. Job gathered at Ashley Pond, a local park, and Fr. Theophan blessed the waters. The prayers and readings were chanted and Father blessed the water by throwing a cross into the pond three times, and then blessed the people with the holy water. On December 4, 2015, St. Job Church celebrated the Feast of the Presentation, also known as the entrance of the Theotokos (Birthgiver of God), the Virgin Mary, into the temple. During this feast, we remember how "according to Tradition, the Theotokos was taken by her parents, Joachim and Anna, into the Jewish Temple in Jerusalem as a young girl, where she lived and served as a Temple virgin until her betrothal to St. Joseph. Mary was solemnly received by the temple community which was headed by the priest Zacharias, the father of John the Baptist. She was led to the holy place to become herself the 'holy of holies' of God, the living sanctuary and temple of the Divine child who was to be born in her. The Church also sees this feast as a feast which marks the end of the physical temple in Jerusalem as the dwelling place of God." 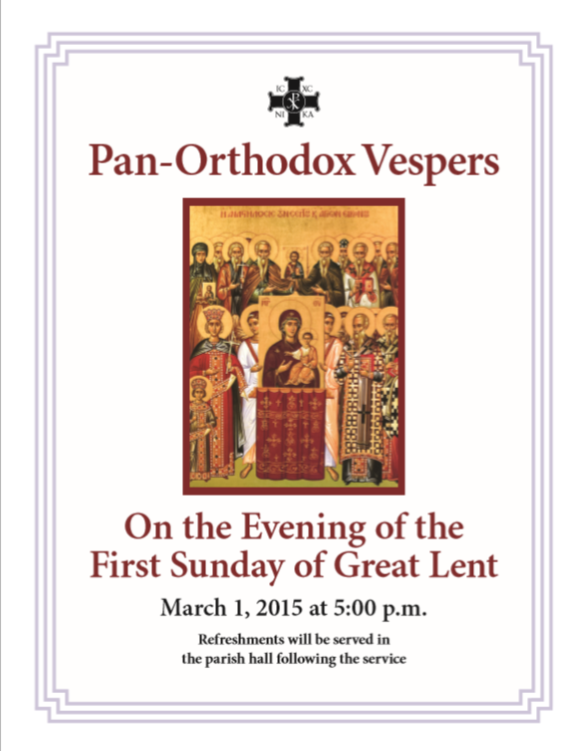 On January 19, 2016, St Job Church celebrated our Lord's baptism, the Feast of Theophany. 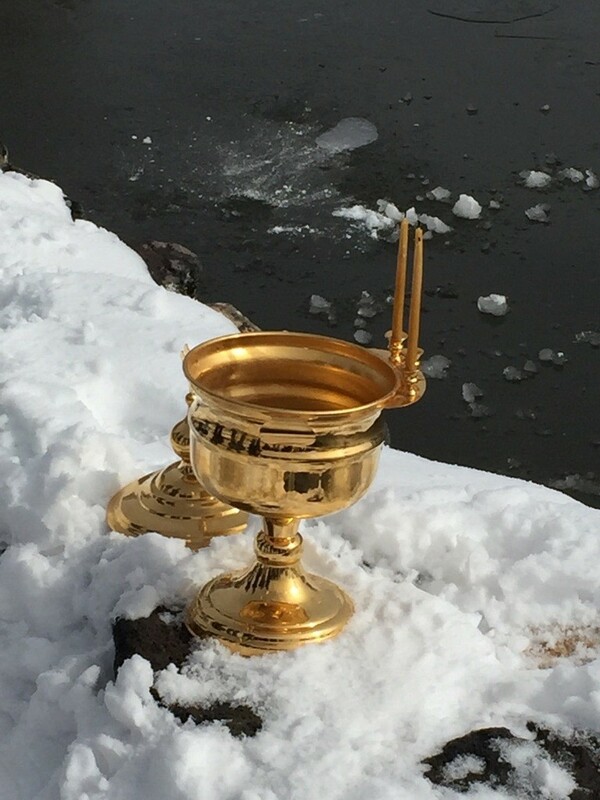 After a short service, the congregation processed down Trinity Avenue to Ashley Pond, where after prayers, Father Theophan blessed the frozen waters with the cross. 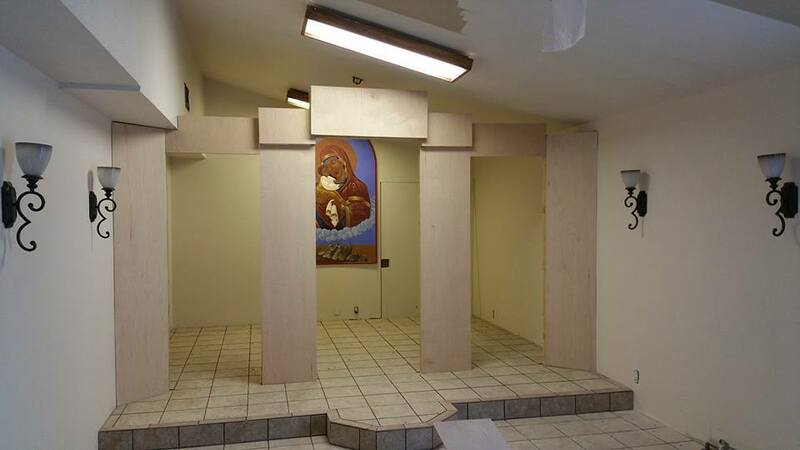 Many thanks to Nicholas Michael for his help with the construction and installation of these new Royal Doors. 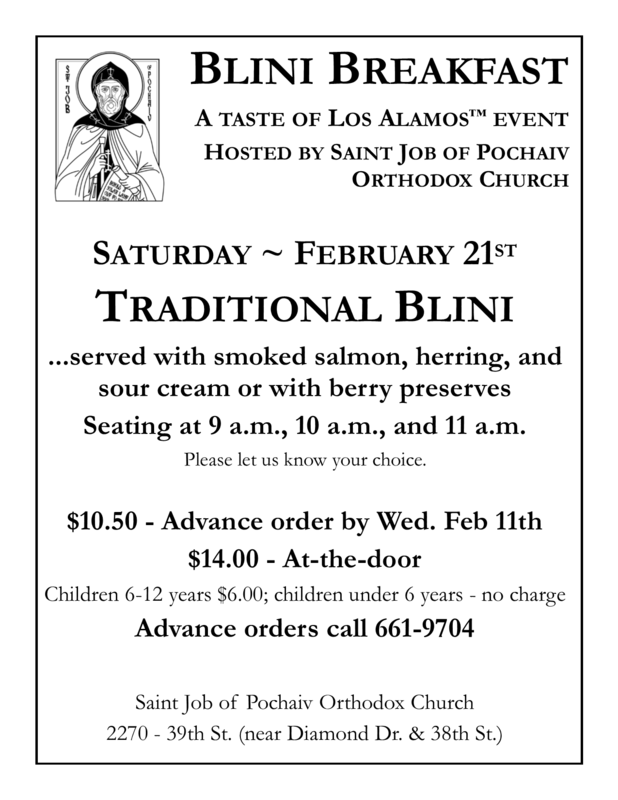 Sometime in 2016, St Job Church will be moving to its new location just off Trinity Avenue in Los Alamos, New Mexico. Right now the building is being refurbished to accomodate a worship space, fellowship space, and much more. Watch this page for updates on our new church building! St Job Church dome to move! 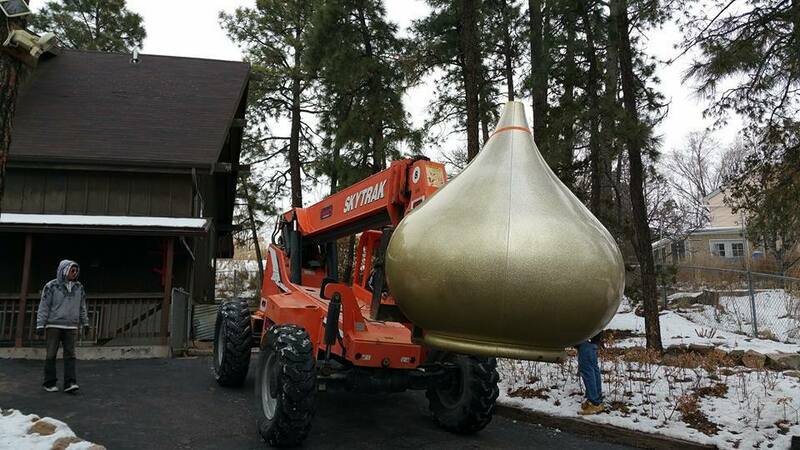 Dome on its way to a new home! 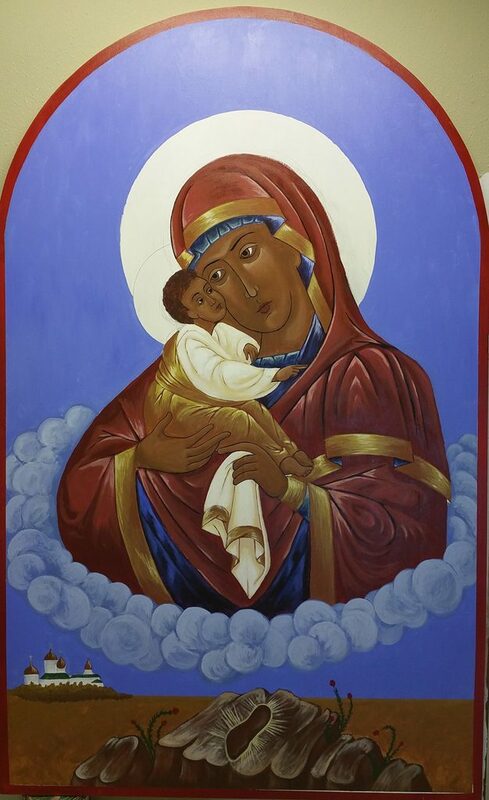 Father Theophan is a skilled iconographer and is painting this new icon, Our Lady of Pochaiv, to hang behind the altar in our new church building. Learn the story behind this icon here. As part of the preparation of the new building, a new blue roof, typical of Orthodox churches, was installed during the month of February, 2016. The dome is next! April 8, 2016 -- Take a peek! The interior of our new church continues to progress. In the altar, the tile is in. Grouting tomorrow. Paint and iconostasis continuing. Tiling in the parish hall forever and ever...thanks to lots of hard work by Father Theophan and parishioners. This expanded course offering involves the study of the ancient floating technique of icon painting in the Byzantine Russian tradition, which reached its height in the XV-XVI centuries. 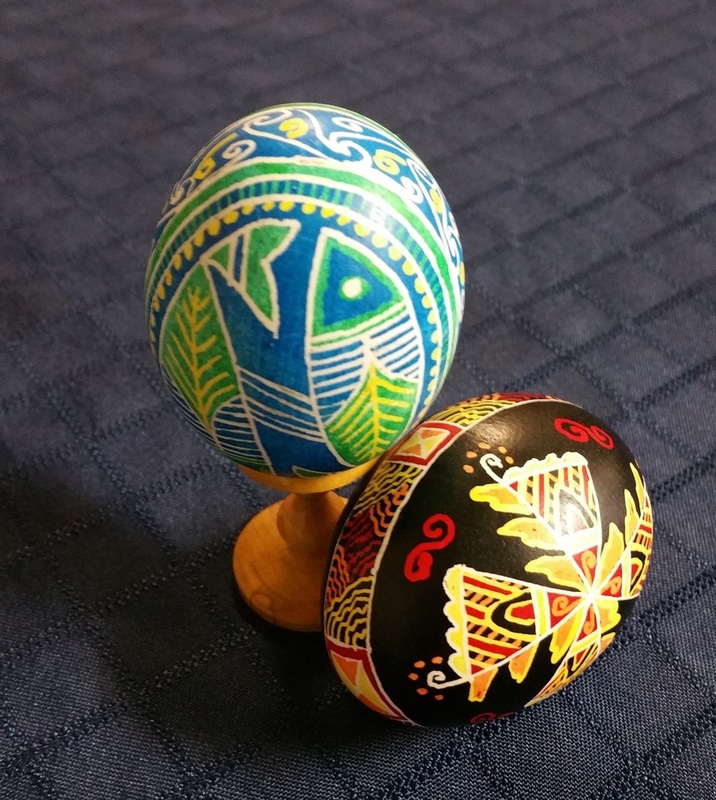 Students will study the many-stepped method of layering egg tempera under the instruction of a teacher from the Prosopon School of Iconology. Gesso application, gilding on bole, and final olipha application will also be taught. Each step has a symbolic and theological basis as a liturgical art. This basis will be taught parallel to the technique. Normally, each individual student completes an Icon by the end of the course. A background in art is NOT required to be successful in this course. Beginner and Advanced students welcome. Download complete course description (pdf). Advanced students will continue their studies with a more complex icon selected by the instructor - or an icon that they have selected - and will work towards its completion. Instruction will concentrate on more advances methods and refinements with a focus on highlights, blending of pigments and geometric proportion of figures. Taught along with the technical painting will be the theological unfolding of the icon. Advanced students may bring their own brushes and other supplies. 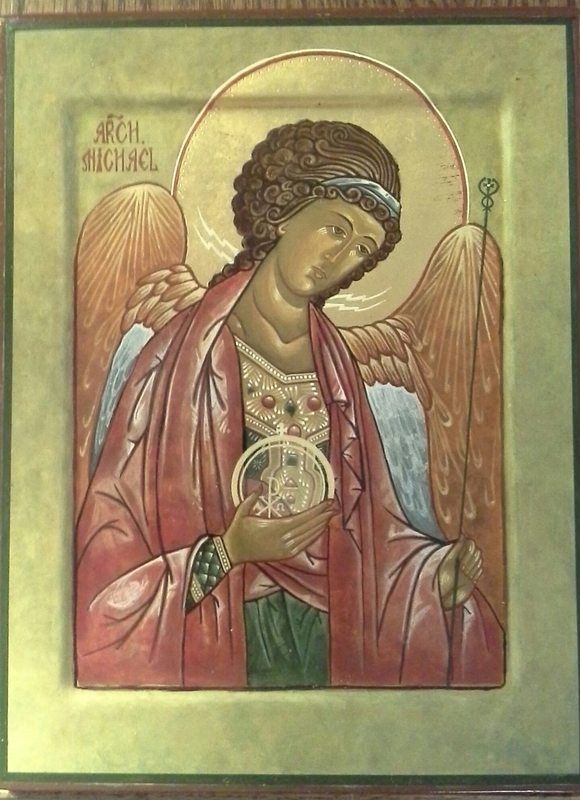 This year advanced students may select icon of the Resurrection or another in consultation with instructor. The Bible; Liturgical Books, i.e., writings of Saint John of Damascus, Saint Theodore the Studite, Saint Gregory Palamas; works of Leonid Uspensky and Pavel Florensky; "The Iconpainter's Pattern Book"; “The Icon” by Egon Sendler which contains both theologyand technical information. Some titles will be available for purchase. Tuition for the workshop includes Instructor tuition, Gessoed “student” (9x14) board. gold leaf sheets (3), pigments, brushes, etc. Tuition is $650 if paid by May 15; if paid after tuition is $665 Advanced students icon board please add $15 Deposit of $325 assures a place in the class (enrollment is limited); the balance is due by June 13. All deposits are non-refundable unless the workshop is under-enrolled, in which case all deposits will be returned. 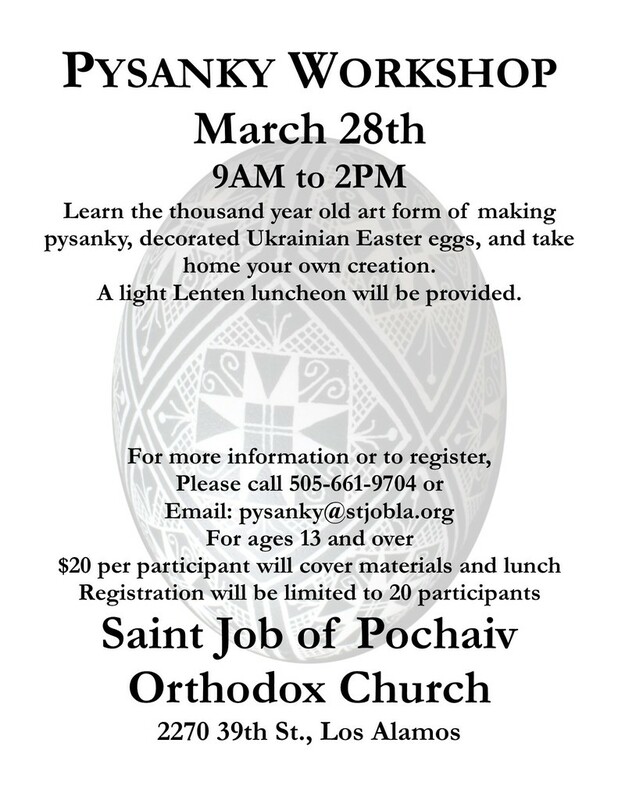 Make check payable to: Icon Workshop-Saint Job Orthodox Church, 1319 Trinity Drive, Los Alamos, NM 87544. A Sobor is defined as an ecclesiastical synod, council, or assembly of the Eastern Orthodox Church. Every three years the Ukrainian Orthodox Church of the United States of America (UOC of USA) holds its Sobor, which is made up of the clergy and two lay delegates from each parish for the purpose of discerning the consensus on important matters concerning the UOC of USA. 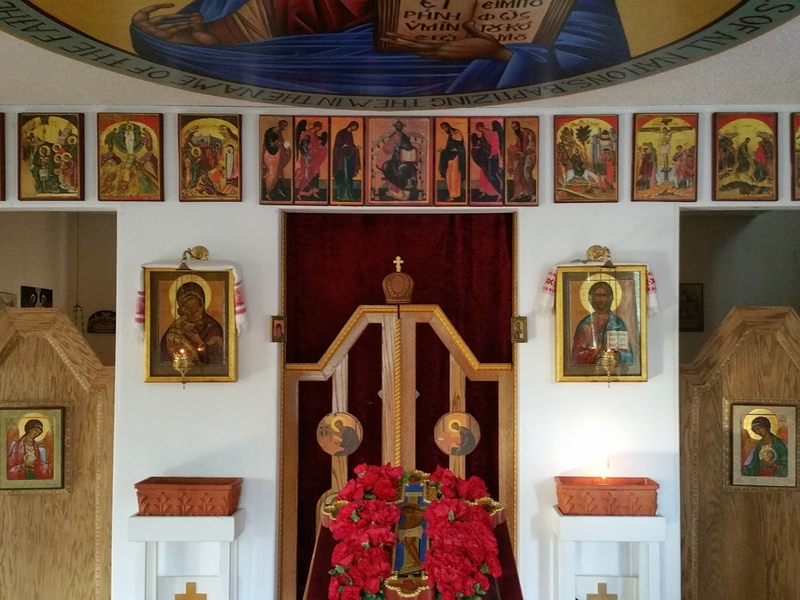 Father Theophan has asked me to share with you some of my impressions of 21st Regular Sobor of our UOC of USA, which was held October 17 - 22, 2016, at the Ukrainian Cultural Center (UCC) in Somerset, NJ, and which bore the title Called by Christ; Gifted by the Holy Spirit. The Metropolia Center Complex has the feel of a college-campus and all the things located there are described at http://www.uocofusa.org/cultural_center.html . 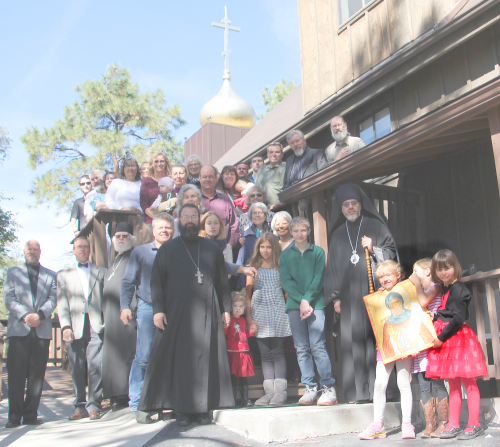 The UCC facility serves as the spiritual, educational, and cultural center for most Ukrainian Orthodox Christians outside of Ukraine. Our meetings were held in the main building of the UCC. Father Theophan and I flew together to the Newark airport in New Jersey, and from there took a taxi to Somerset, (South Bound Brook), NJ. we stayed in the Hotel Somerset Bridgewater conveniently located within walking distance of the UCC. A day later we were joined by our other delegate, Elizabeth Bezzerides, who flew in from Boston where she was visiting her son and his family. Almost all the meetings took place in the large multipurpose room of the main building of the UCC building, which also doubled as our dining hall. The kitchen and serving staff prepared three delicious meals each day for the Sobor clergy and delegates. That staff worked from before dawn, throughout the day, and into the evening hours, cooking, serving, moving around tables, chairs, and portable curtain walls in order to accommodate the meetings, meals, and other functions at the Sobor. The agenda schedule was ambitious and thorough, and I recommend that you browse through the white three-ring binder notebook if you are interested in any of the details of the schedule and rules of the Sobor and the many reports presented, which covered all aspects of the functioning of the UOC of USA. 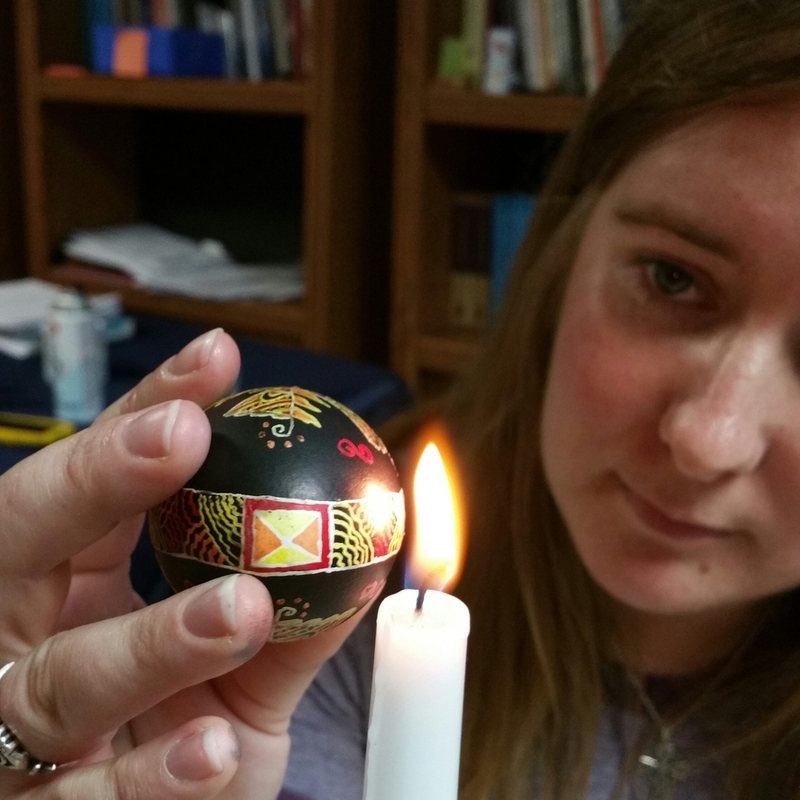 The Mission of the Ukrainian Orthodox Church of the USA is to offer healing, comfort, wholeness, spiritual fulfillment, and joy as we work together to reveal the beauty of God’s creation by proclaiming and living the Gospel of Jesus Christ. The Vision of the UOC of USA is to transform lives through Christ-centered, compassionate, and welcoming communities that embody Sacred Scripture and Holy Tradition while serving and ministering to people as they navigate contemporary life. This Strategic plan was adopted the 21st Sobor of the UOC of USA by a unanimous vote, and will serve as our working document as we move forward into the future. I highly recommend that everyone at St. Job’s Parish plan to attend one of the future Sobors either as one of the two delegates, or as a guest. 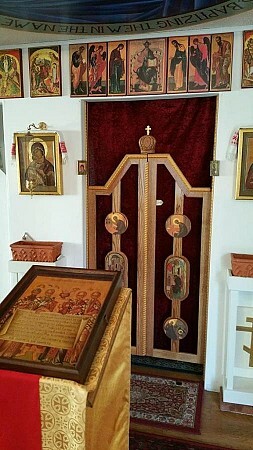 I guarantee that it will be an edifying experience with daily divine liturgy services in the morning; wonderful food and fellowship at the three meal-times of the day; and then the “wall-to-wall” meetings and reports with the goal of prayerfully charting the future course of the UOC of USA. June 25, 2016 -- Drs. David and Mary Ford visited St Job Church to present the lecture, "Marriage as a Path to Holiness." Dr. David Ford's talk on holiness in marriage and tips for infusing Christianity in family life was well-attended and motivating to all! 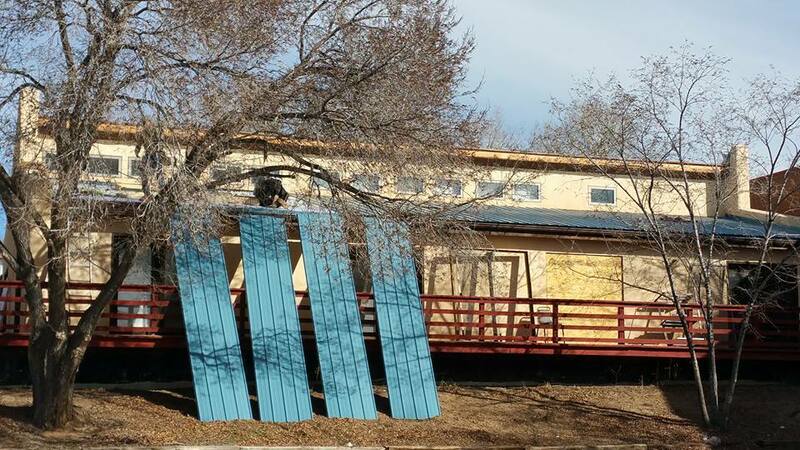 For this event, we were able to get a permit to temporarily use our new church space, in development on Trinity Avenue in downtown Los Alamos. The picture shows a glimpse of our new fellowship space. For more information on this topic, check out the Fords' two books, Marriage as a Path to Holiness: Lives of Married Saints.